Thank you, Philips, for sponsoring today’s post! Hey, friends! 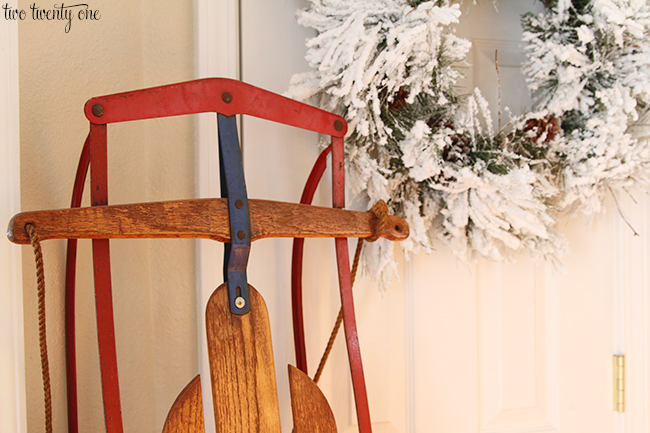 Today I’m sharing our Christmas entryway. For the past few years, I’ve set up a smaller Christmas tree that displays our sentimental Christmas ornaments (here’s 2011 and 2012). 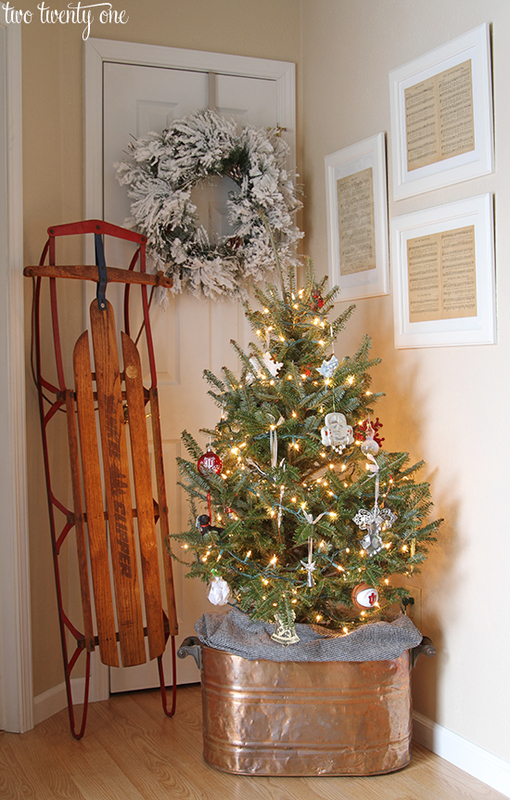 But there’s a slight twist this year– I used a real tree. My first real tree. Well, first real tree as an adult with my own house. Jack digs it. I worked a lot of sentimental items into the entryway this year. The copper boiler, which is acting as the tree stand, belonged to my mom. I grew up with this antique gem in our house. My brother has had it for the past few years, but I’ve been holding on to it since he moved to California a few months ago. I’m hoping he forgets it’s in my possession and fails to ask for it back. I showed the photo of it acting as a tree stand to my mom, and she thinks I should keep it. Basically because I’m her favorite child. I used boxes inside the copper boiler to give the tree height. A random black and white houndstooth print piece of fabric I found at a thrift store outlet a year ago acts as the tree skirt. I also used my childhood flexible flyer. I was so happy when I asked my mom about it and she said it was up in her attic. I still have vivid memories of sledding down the giant hill in my hometown on that thing with my mom. When I was home this summer past, I came across a box full of my late Grandma June’s sheet music. We’re talking sheet music from the 1920s. I also found some sheet music that belonged to my mom and my aunt (they’re identical twins, in case I hadn’t already told you that) when they were kids. So I grabbed Bonnie’s and Connie’s Christmas sheet music books and a copy of Jingle Bells, that belonged to my grandma, and framed them. I’ll show you how I framed them, without harming the delicate sheet music with tape, on Monday. I love how it looks, and that it’s something with meaning. I’m a sucker for sentimental stuff and family heirlooms if you hadn’t picked up on that yet. The flocked wreath was a Shop Small Saturday find from a few weeks ago. It was only $25 so I jumped on it. In case you’re wondering, I got it at Gehlhausen Floral in Evansville, Indiana. Here’s how this part of the entryway looks at night. I love how the tree glows. The other part of the entryway involves our entryway table. I’ve been decorating it for the past few years with the white ceramic Christmas tree my late Aunt Pat made for me when I was a kid. Every Christmas my mom would display the tree in my bedroom. Unfortunately, the bulb for the tree burnt out this year. But thankfully, my friends at Philips offered to send me a new LED bulb to try out. 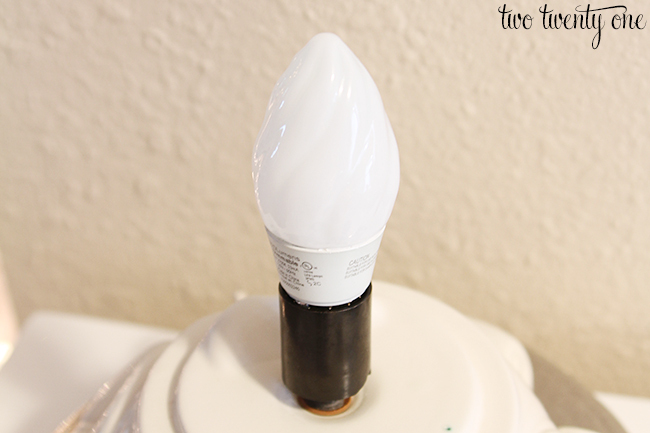 I never thought I’d love a lightbulb, but I love this one. It makes the blue lights on the tree shine so much brighter than the old bulb. Photos don’t do it justice. I’m also in love with this bulb because it has a 25,000 hour life, which equates to nearly 23 years. Speaking of Philips, they’re currently hosting a giveaway for a $3,000 lighting makeover! One lucky winner will receive a design consultation, new fixtures and bulbs for their home. Click here to learn about all the details. Also, I’m pinning some great entryway ideas onto the Philips Bright Ideas for Entryways Pinterest board so definitely check it out! This post was brought to you by Philips. As always, opinions are 100% my own. 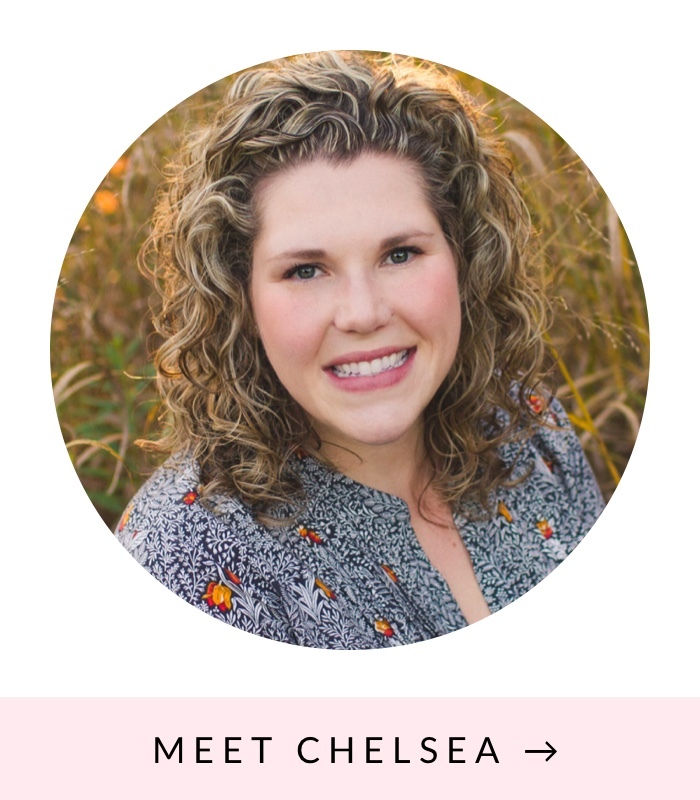 I love all of your little touches, Chelsea! 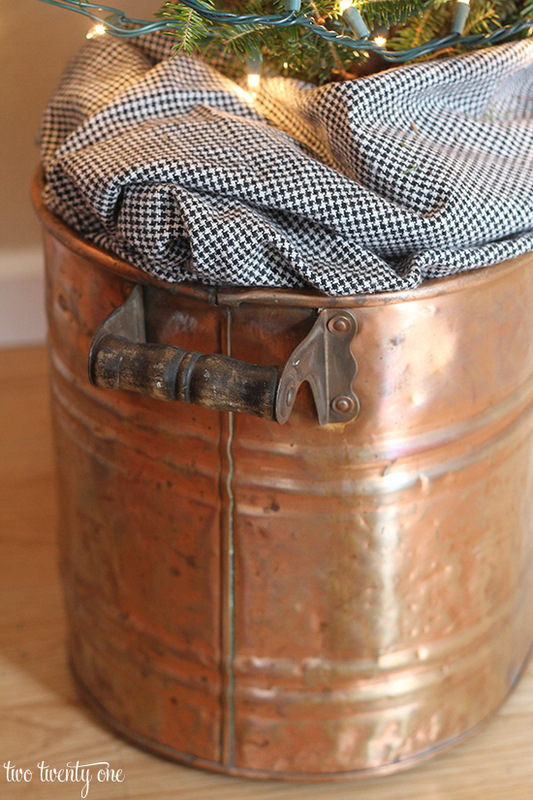 The copper boiler is such an awesome idea! LOVE your entry way! Everything looks great together. 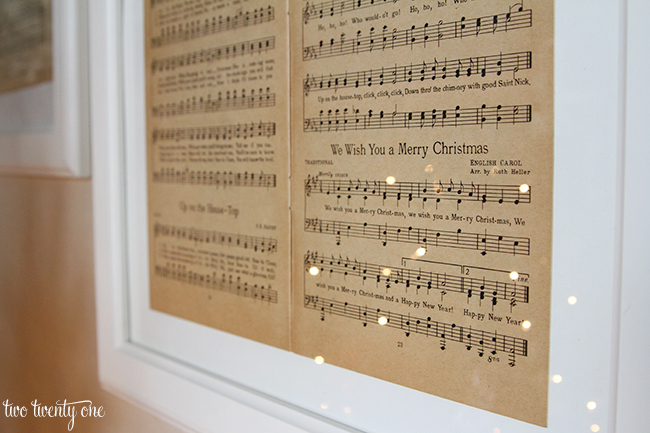 I really love how you hung the Christmas sheet music. I might need to get some from my Grandma and do the same thing. Love it all Chelsea! 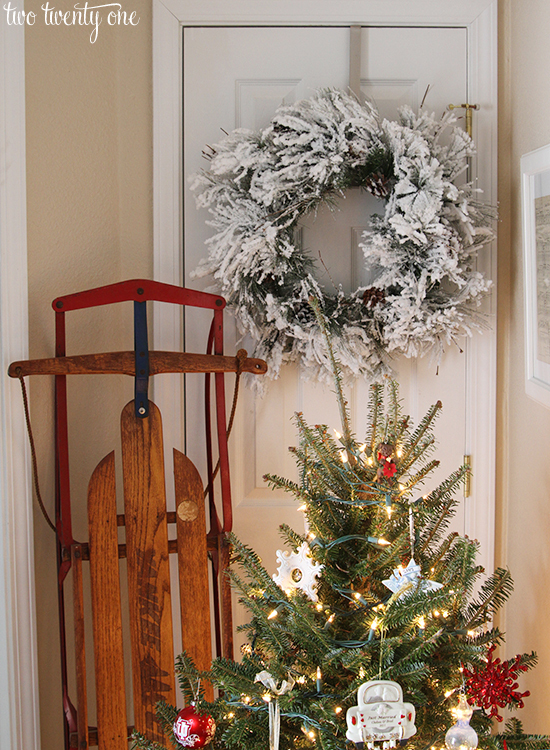 The corner with the tree and sled is so magical! Your entry is beautiful! I love the ceramic trees! We had one when I was a kid. I’m also a big fan of your mirror. This is incredible! 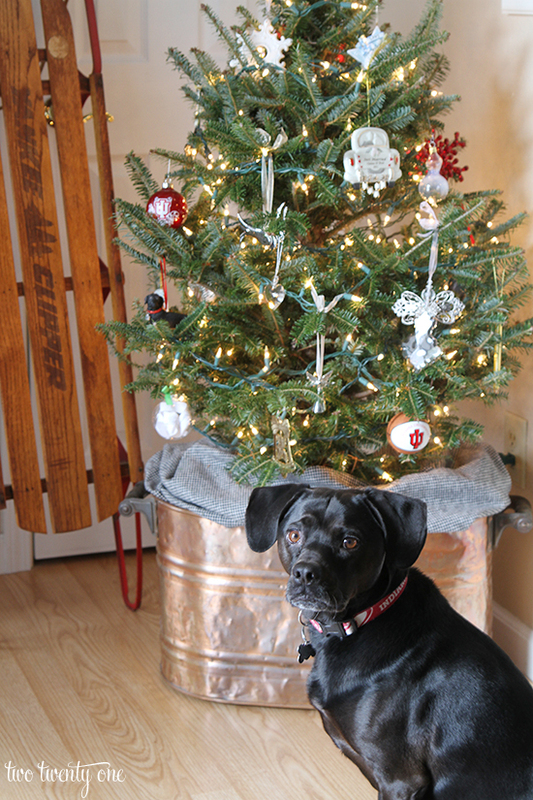 I love the use of the vintage copper boiler and sled! Well done on framing the sheet music, too. It looks great. I also adore your ceramic tree. I seem to remember my paternal grandma having something similar. My dad took care of everything after she’d passed, so maybe I should ask what became of that little tree. It was fun to see you at the Philips Twitter chat party yesterday, too! They should do those more often. It was a good time. Gorgeous!! 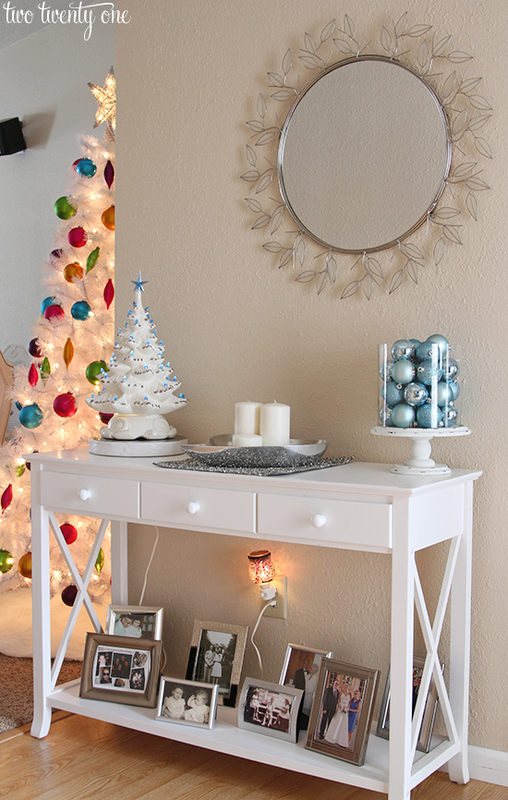 And that little tree with the blue lights is a more modern version of the one my mom always put up…LOVE it!! Very cute! 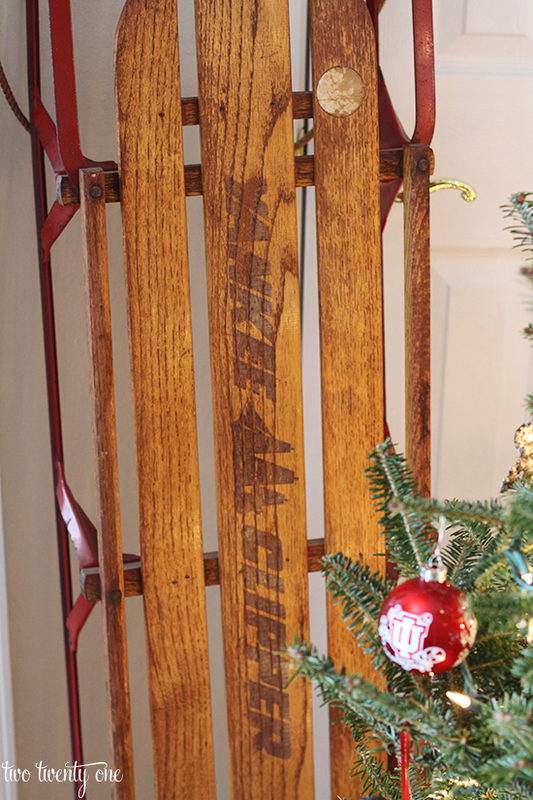 I have a sled that I picked up for $4 at a thrift store but just haven’t found the right use. Yours looks great! It is absolutely perfect. 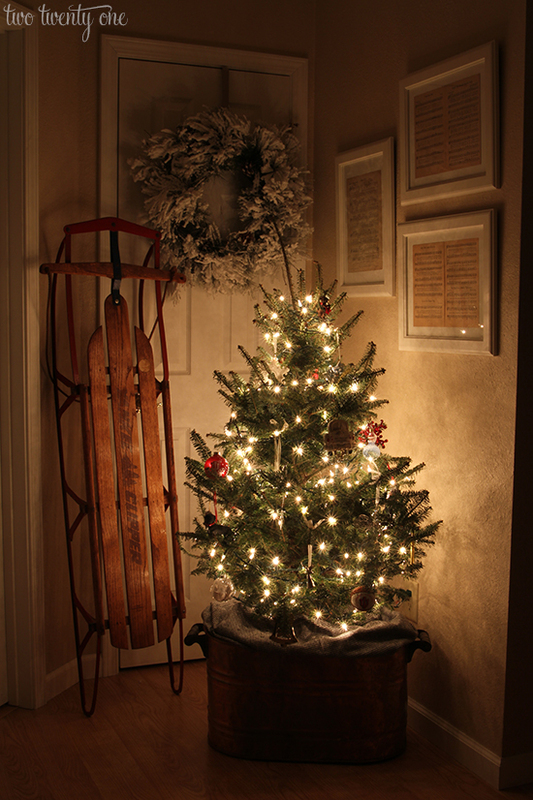 It feels like an old fashioned Christmas, warm and inviting. You nailed it! The sheet music is a beautiful touch. 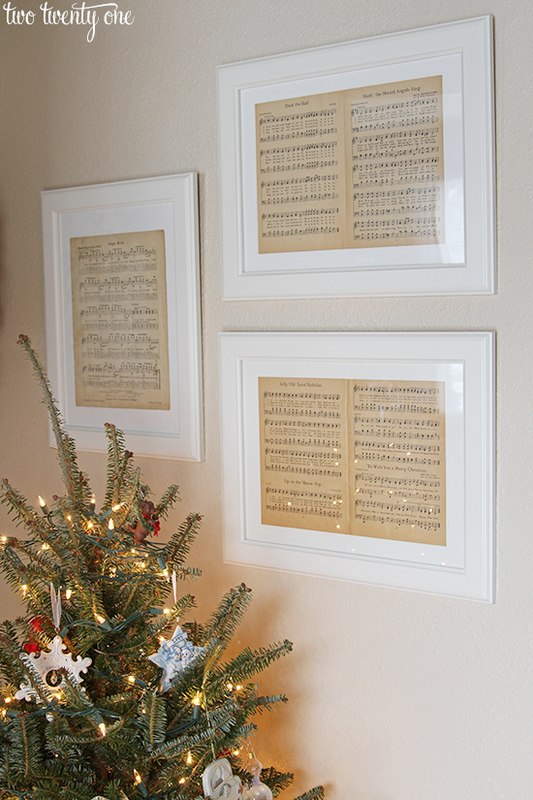 I love how woodland-y your entry looks – the framed sheet music is such a lovely idea. I love the copper boiler! How are you watering the tree? The sheet music is also particularly awesome. Thanks, Ginger! Just putting water in the tree stand that came with the tree. Oh my goodness! I LOVE the addition of the sheet music to this space! That is so special. Your entry way is so CREATIVE I LOVE it! The old school sled is the best! Greetings from frozen Chaska, Minnesota! 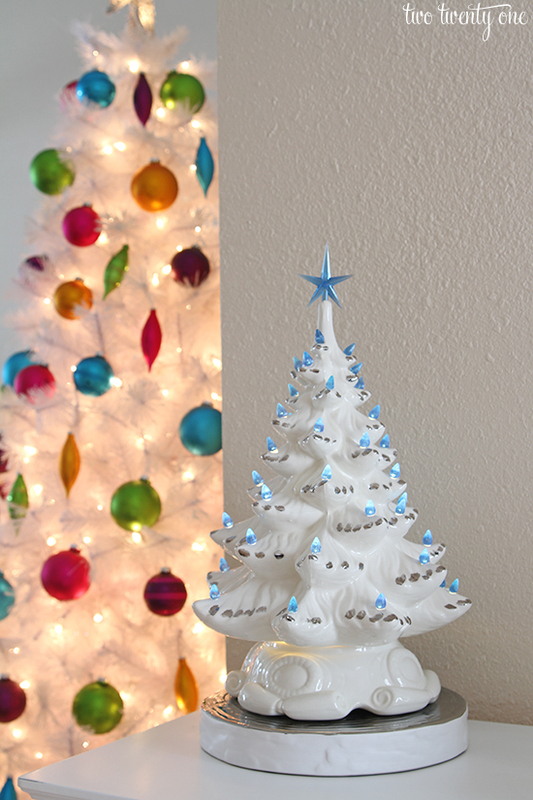 I’d really like to acquire some of those ceramic light-up trees like your gorgeous white + blue one. Are they sold unpainted so I could customize each trees’ and lights’ colors? I love that you received yours from an aunt as a child, and I’d like to do the same for for my nieces and nephews. Do you know which stores carry them? Are they DIY in a pottery shop or bought as is at a craft shop like Michael’s? 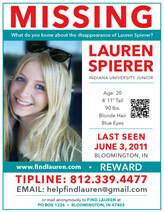 I’d sure appreciate any info you or your readers could pass on!!! Have a blessed, healthy and happy 2014!